It’s been an eventful year for Square Roots Productions, which became a charity in October 2015. We have now hosted a series of concerts celebrating the Anglo-American folk tradition featuring both new and legacy artists. Our inaugural gig at London’s Green Note featured Dan Evans and Virginia Thorn in a highly praised tribute to the late Jean Ritchie, widely regarded as ‘the mother of folk music’. It was followed by an evening with legendary Wizz Jones and rising star Dariush Kanani, and then by Bonnie Dobson, who emerged from the Toronto folk scene in the early 1960s to write a rock classic, ‘Morning Dew’. Playing with her was Harry Phillips, a talented young singer-songwriter who has just released his debut album. And in the USA, in partnership with New York State Arts, Square Roots Productions presented a concert to mark the opening of an exhibition celebrating the life and work of Jean Ritchie at the New York State Library in Albany. That concert featured Ritchie’s son Peter Pickow, with David Massengill and Susan Trump, two artists heavily influenced by Ritchie, whom they both met. Square Roots Productions has exciting plans for 2017 and beyond – so please check back for further news. Many thanks for supporting us – and if you like what we’re up to, please feel free to visit the donations page of our website! In the meantime, we wish you a merry and folk-filled Christmas. 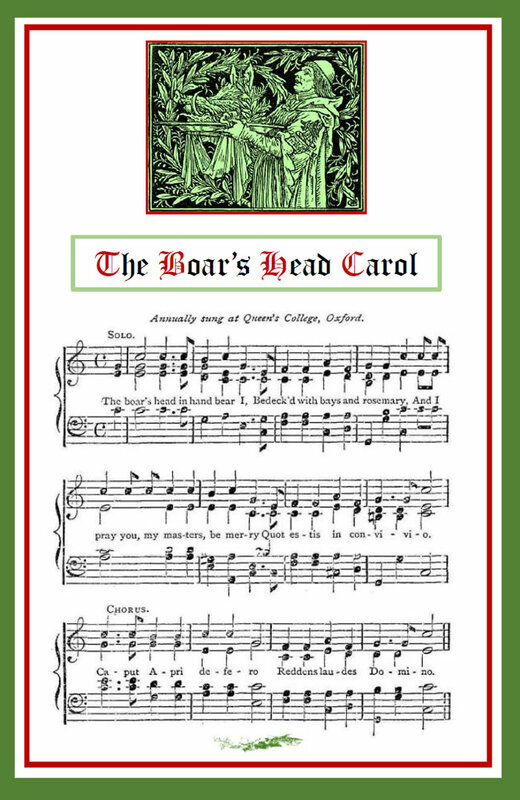 ‘The Boar’s Head Carol’ is a 15th century English carol that describes the ancient tradition of sacrificing a boar and presenting its head at the Yuletide feast. There are many variants, the most common one based on a version published in Wynkyn de Worde’s Christmasse Carolles (1521).